CLARK, JAMES ANTHONY (1908–1978). James A. Clark, author, columnist, and public-relations consultant and historian of the oil industry, was born in 1908 in Abita Springs, Louisiana, and grew up in Beaumont, Texas. He attended South Park Junior College (now Lamar University) and worked for Magnolia Petroleum Company cutting out oil-equipment parts. In 1927 he became sports editor for the Galveston News, and the same year found him in Beaumont, where he had a local beat as a reporter for the Journal. In 1931 Clark was assigned to interview Columbus M. Joiner, who had just brought in Daisy Bradford No. 3 and opened up the East Texas oilfield. In 1935, when James Allred became governor of Texas, Clark was appointed statehouse correspondent in Austin. From 1941 to 1946 he served the United States Army as an intelligence officer in Puerto Rico, the Pacific, and Japan. He left the army as a lieutenant colonel with a bronze star and after the war became public-relations manager for the Shamrock Hotel in Houston. Drawing, Cover of Spindletop, a book by James A. Clark. Image available on the Internet and included in accordance with Title 17 U.S.C. Section 107. 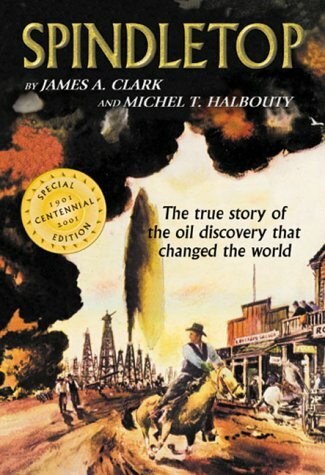 The publication of his first book, Spindletop (1952), with Michel T. Halbouty, gave Clark a position in the oil industry. He began a firm for public-relations consulting, the James A. Clark Company, and started a regular oil column, "Tales of the Oil Country," which he wrote for the next fourteen years. He also began research for other books on the oil industry. In 1954 he published Three Stars for the Colonel: The Biography of Ernest O. Thompson, and in 1958 The Tactful Texan: A Biography of Governor Will Hobby. His other books include The Chronological History of the Petroleum and Natural Gas Industries (1963) and The Last Boom (1972). Spindletop is listed in John H. Jenkins III's Basic Texas Books. Clark married Estelle Walton in 1934. In 1969 he established the Energy Research and Education Foundation in Houston. He died on April 5, 1978, in Houston. Houston Post, April 6, 1978. Vertical Files, Dolph Briscoe Center for American History, University of Texas at Austin. Handbook of Texas Online, Jerrell Dean Palmer, "CLARK, JAMES ANTHONY," accessed April 19, 2019, http://www.tshaonline.org/handbook/online/articles/fcl52. Uploaded on June 12, 2010. Modified on October 24, 2016. Published by the Texas State Historical Association.